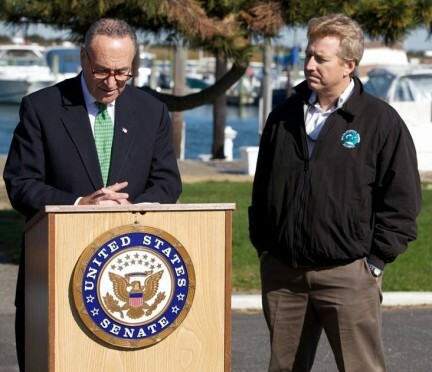 Sen. Charles Schumer at Point Lookout, NY talking about saltwater fisheries issues as the Federation’s Jim Hutchinson looks on. A recognized 501(c)(4) non-profit, the New York Sportfishing Federation works not only to promote the sportfishing community in New York but also works with state legislators on protecting the interests of the community. As per the New York Sportfishing Federation bylaws, the organization shall be managed by the Board which shall consist of not more than fifteen Directors, including the President, Vice President, Secretary and Treasurer. The New York Sportfishing Federation is present and active at every single meeting of the Marine Resources Advisory Council (MRAC) in New York – key voting councilors are also Federation members and even board members! On August 5, 2011, Governor Cuomo invited members of the New York Sportfishing Federation to Freeport to celebrate the repeal of the saltwater fishing license and refund of angler monies. The New York Sportfishing Federation holds important seats on the New York State Fishing Advisory Board, South Shore Estuary Council, as well as the Citizens Action Committee for the Long Island Sound Study where we recently helped lead fellow members to exclude any mention of ‘marine reserves’ or ‘marine protected area’ designation from future efforts to protect and conserve resources on Long Island Sound, further protecting future opportunities for New York anglers. New York Sportfishing Federation board members are also active at the regional level as well, working hard to ensure that our representatives at the Atlantic States Marine Fisheries Commission and Mid Atlantic Fishery Management Council continually hear the collective voice for New York’s 291,000 saltwater anglers. It was that “voice” which was heard quite clearly from Albany all the way to DC in the fall of 2009 when New York government implemented a new saltwater fishing tax on individual anglers and business owners. Legislators responded to the heavy angler opposition to a marine license, and with dedicated help and support from the New York Sportfishing Federation, the fee to fish was ultimately repealed in 2011. The Federation is also an active, voting member of the Partnership for Mid Atlantic Fishery Management Science (PMAFS), which is helping support important scientific efforts for our coastal resource management through work with independent scientists from Cornell and Rutgers. Support any other purpose that is consonant with the protection of the marine environment and the interests of the marine recreational fisher. New York Sportfishing Federation members with Sen. Lee Zeldin, champion of the saltwater fishing license repeal. 501(c)(4) organizations operate exclusively for the promotion of social welfare, or local associations of employees with membership limited to a designated company or people in a particular municipality or neighborhood, and with net earnings devoted exclusively to charitable, educational, or recreational purposes. 501(c)(4) organizations may lobby for legislation, and unlike 501(c)(3) organizations they may also participate in political campaigns and elections, as long as campaigning is not the organization’s primary purpose. Contributions to 501(c)(4) organizations are not deductible as charitable contributions for the U.S. income tax. 501(c)(4) organizations are not required to disclose their donors publicly.